If the borrower locks their user account by typing in an incorrect password multiple times, the loan officer has the ability to Unlock the borrower’s account directly in the iMP. The borrower will receive an error message within the Consumer Site prompting them to contact their loan officer to unlock their account. The loan officer will notice that the silhouette figure found under the Personal tab is now marked in red. 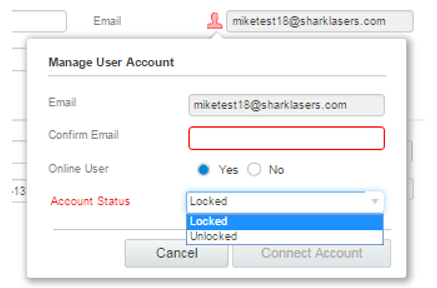 The user must hover over the silhouette figure to access the Manage User Account modal in or to reset the locked account. The user will need to Confirm Email address of the borrower and select Unlock under the Account Status dropdown.